Chipotle paste in another great store cupboard ingredient which adds an abundance of flavour for the grand total of 0sp! Whilst it’s great on roasted vegetables, I think it’s even better when its flavours are released in a lovely warming stew. I’ve used quinoa as I like to try out new pulses and grains every now and then. It’s a lovely change and the lime adds a great refreshing flavour, especially with the chicken stock cube. 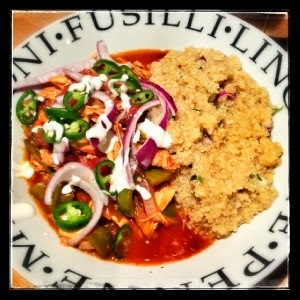 If you’re not keen on quinoa the stew would also be lovely with rice or even stuck inside a WW wrap with some salad! Fry the white onion and peppers in 1kal and a little water until they start to soften (around 5 minutes) then add garlic and mushrooms and continue to fry for a few minutes until soft. Add 2-3 tsp of chipotle paste (depending on how spicy you like it), stir into the veg mix and cook for a further minute. Add a tin of chopped tomatoes and then add half a tomato tin full of water. Place the chicken breasts in the sauce so they are covered by the water. Add 1 tsp of sugar, 1 tbsp of tomato puree and the paprika and cayenne and then season with salt and pepper. Simmer for 20 minutes (or until the chicken is cooked through). As the stew starts to simmer pop the quinoa in a pan with the chicken stock cube and cumin and cook according to the packet instructions. Once cooked stir in the juice of a lime, a small amount of sliced red onion and half of the coriander. After 20 minutes, remove the stew from the heat and using two forks, shred the chicken through the sauce. Add back to the heat and simmer for five minutes then add the rest of the coriander to the stew giving a good mix. Serve the stew in a bowl with the quinoa on the side. Top the stew with the remaining red onions and chilli and serve with a dollop of light sour cream. Crispy Chinese Belly Pork with a lovely light dipping sauce – just 15sp! Just had this tonight and it was so yummy… Really easy too which is a bonus! Tried a veggie version using quorn fillets. It was lovely. So glad you enjoyed it Debi!